Tidewater Recap – Only a Week Late – Ya Like Dags? 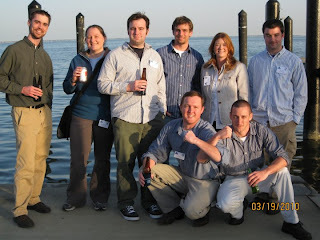 Last weekend some members of ECU’s AFS student unit (including yours truly) headed up to Annapolis, Maryland for the annual meeting of the AFS Tidewater Chapter (which includes fisheries professionals and students from Delaware, Maryland, Virginia, and North Carolina). 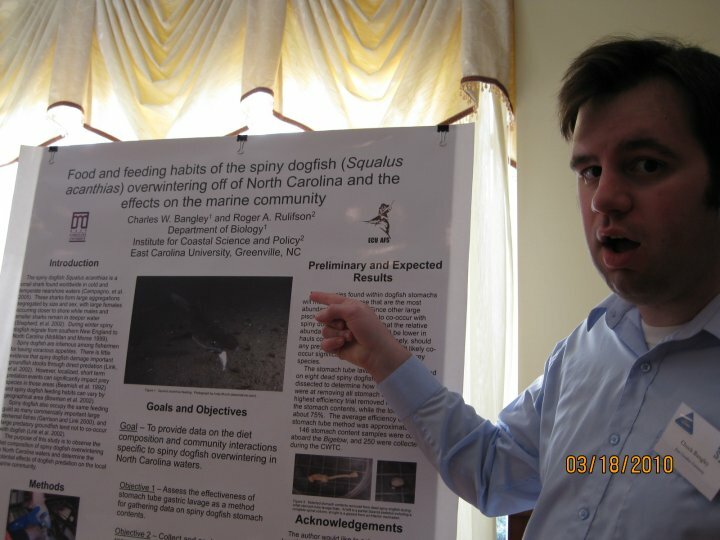 Not only was this my first true fisheries conference, but I also gave a poster presentation on my work so far. Here’s a short form recap of the weekend, and a couple (non-incriminating) pictures. The speaker clearly has trouble with his name tag. The poster presentation was the first event of the conference, and ECU was well-represented here. Aside from my own meager body of work, Dan presented his poster on river herring nursery habitat and Jacob talked at length on his work with striped bass (I’ll have them chime in about their work someday. It is very interesting stuff, even if it’s not shark-related). Though mine was the only shark poster there (and got a decent amount of attention for it), there were several others that were interesting to me from a diet/large predator standpoint. These included Paul Ruderhausen’s poster on the feeding ecology of large pelagic fishes and Joe Facendola’s study on the diet of red drum (he actually used gastric lavage to extract the stomach contents! Unfortunately I never got a chance to catch up with him and see how it worked out). Marissa Brady’s work with mark/recapture and telemetry of American eels took home the top poster prize. I actually really enjoyed the poster presentation part of the evening. Basically you stand near your poster (usually with beer in hand) and answer any questions given to you by the readers. I think I actually prefer this conversational style of presentation over giving a full-blown talk, though I’ll withhold final judgment until after I’ve given a talk in a professional setting like this. It was all very low-key, and it was encouraging to see that a lot of the “audience” interested in what I was doing. I got some very good advice on where to go with the analytical side of my diet study, and got to meet Jack Musick, hopefully without looking too foolish (again, beer in hand). That night we made our preliminary exploration of the Annapolis area and were impressed with what we saw. And that’s about as in-depth as I’m at liberty to go. Beginning the second morning was a full day of presentations. Much to my chagrin I was still paying for disappearing from school for three weeks to play with dogfish, so I had a take-home exam that caused me to miss a good chunk of the talks. The rest of the ECU crew filled me in on what I missed, though obviously it wasn’t the same as actually being there. The entire first half of the day was dominated by striped bass, so Jacob was all over that. Of interest to me were Alison Deary’s presentation on tuna habitat, Edward McGinley’s use of fatty acid signatures to determine striped bass diet, Matthew Breece’s work with Altantic sturgeon, and Paul Ruderhausen’s talk on survivability of circle hooks (of interest to me as both a recreational fisherman and a fan of large fish). Our very own Cecilia Krahforst picked up first prize for student presentations with her work on the use of acoustics to monitor fish populations. 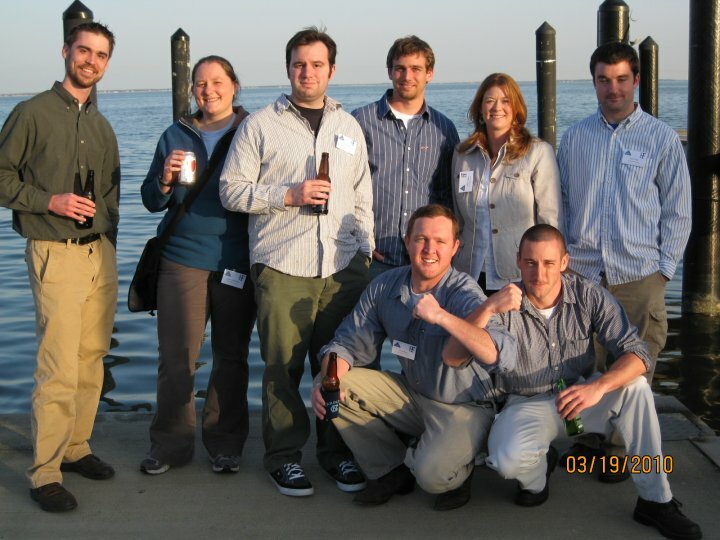 The social was at the Chesapeake Bay Foundation. The building itself was unique in that it was designed to be totally green, all the way down to compost toilets (which surprisingly didn’t smell bad at all). Beverages were provided by the always excellent Dogfish Head Brewery and featured the Shelter Pale Ale, which I’d never had before (despite it being based on their original recipe) but will be drinking frequently in the future. The ECU crew. Can you spot your intrepid author? That night we again explored Annapolis. Obviously, science was discussed. Saturday morning’s talks were almost entirely about blue crabs (it is Maryland after all). I missed some of these talks tracking down breakfast, but Dan and Ceclilia saw all of them and Dan reported that the tethering experiments were “hilarious” (the idea behind these is that the crabs are basically tied to a stick and left to be eaten. This aids in determining natural mortality and applying gallows humor to a decapod). So my first real conference experience was a good one, and a valuable one. I’ll be taking my dogfish project on the road again in July when I present a poster at the Joint Meeting of Icthyologists and Herpetologists in my old motherland, Rhode Island. It’s sponsored by URI, so I hope to make my undergrad alma mater proud. The topics all sound very interesting. And, yes, Annapolis is very pretty. Hey, I came across your blog while trying to hunt down my tidewater abstract online. (I’m Joe Facendola by the way) In regards to the effectiveness of gastric lavage, it seemed to work very well. I was most confident in my ability to completely retrieve all gut contents from the smaller fish, as you could actually feel any prey items through the drums body. I did sacrifice some live fish after flushing their stomachs, and found them to all be empty. Most of the larger fish I examined were from dead from DMF long line surveys, so the entire stomachs were removed. However, I was able to retrieve gut contents from the handful of large fish that I captured live using gastric lavage. Sometimes really long (eels), or really spiny (crabs) prey would take a few attempts to flush out, but all in all I would say that the lavage technique was effective and generally non-lethal. Pingback: Dogfish on Tour: Upcoming Travel Plans | Ya Like Dags?